Cadi.Sense Wireless Thermometer is a new-age thermometer, which revolutionizes the way temperature is measured. Whether your child is playing in the play pen or sleeping in a cradle or watching his/her favorite cartoon or even studying at his/her desk, you will be able to monitor his/her fever continuously without him/her knowing it. 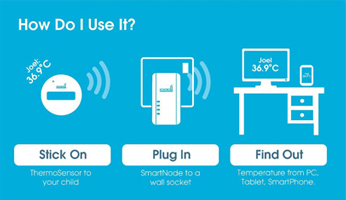 This device monitors temperature by attaching a wireless thermosensor device to the body and the SmartNode Plug to any wall socket. By using a smartphone or a WiFi enabled device, the patient’s temperature can be continuously checked at regular intervals of time. Cadi.Sense provides the child’s continuous temperature trend via a web application or mobile application on the iPhone, iPad, or any WiFi enabled mobile devices or computer.